Jared DeSantolo’s double into the right-field corner scored Eric Rivera from first base with the game-winning run as Florida Atlantic walked off with a 9-8 victory over Rice in 10 innings in a semifinal of the 2018 Conference USA Baseball Championship. With the win, third-seeded FAU (40-16-1) earned a first-ever spot in a C-USA baseball championship title game and will be playing for their first postseason baseball championship since winning the Sun Belt Conference tournament title in 2013. “It’s an amazing night, an amazing night,” FAU John McCormack said. “(Friday), when we got done, I told them, ‘You can make May 26, 2018, something that we talk about for the next 25 years, and we are. FAU awaits the winner of Sunday morning’s other semifinal showdown between top-seeded Southern Miss and fourth-seeded Charlotte. The 49ers forced a second game with the Golden Eagles with a 7-4 win earlier Saturday evening. With the win, FAU also likely wrote the final page of Coach Wayne Graham’s career at Rice. The 82-year-old Graham did not have his contract renewed, and will leave after 27 years at the helm. By falling twice Saturday, Rice saw a streak of consecutive NCAA regional berths snapped at 23. 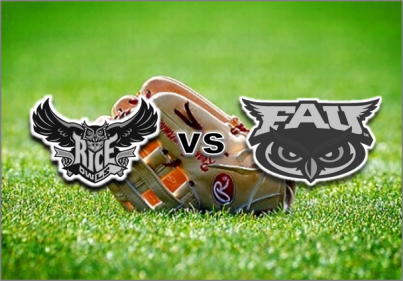 A three-run rally in the third inning erased an early FAU lead, and Rice held the lead through the top of the eighth inning, building it up to 8-5. But FAU tied the game in the bottom of the eighth on an RBI-double by Rivera, and run-scoring grounder by DeSantolo and Joe Montes’ run-scoring single. After a scoreless ninth inning, Rice (26-31-2) loaded the bases in the top of the 10th but came up empty. Matt Canterino (7-5), who was the starting pitcher in Rice’s championship opener, walked Rivera to open the bottom of the 10th inning, and DeSantolo followed with the game-winning hit. Zach Schneider (6-1) got the game’s final two outs to pick up the pitching win. DeSantolo and Montes each had three hits and drove in two runs for FAU.